Christianity is a faith based on factual events which really happened in time and space. It is not a mystical faith based on good feelings. The miracles of Jesus were His calling card; i.e., the validation of His claim to be God. The resurrection was His proof of identification. Even more importantly, the death and resurrection of Jesus were God's method for sinful mankind to stand forgiven before Him. God's nature demands payment for wrong, yet He is merciful beyond comprehension. How can these two contrasting sides of God be reconciled? Without acknowledgment of the factual nature of the resurrection, Christianity is nothing but smoke and mirrors; just another spiritual attempt to explain reality based on man's opinions. In spite of the obvious historical accuracy of the Bible, there have been many alternative explanations for the missing body of Christ. Liberal theologians have even speculated that Christ’s body ended up in a ditch. Yet Jewish laws would never have allowed this. The two most prevalent attempts to explain away Christ’s resurrection will be examined in this article. 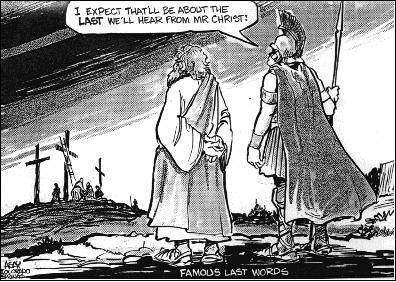 The most popular excuse for rejecting Christianity is the idea that Christ did not really die on the cross. Although this has been suggested in recent years, no one who witnessed His death considered this a real possibility. The idea of a man reviving himself after he had been brutally beaten, nailed to a cross, pierced with a sword, and tightly wrapped with suffocating clothes is ridiculous. For such a person to push aside a huge stone and sneak past trained guards is ludicrous. Even more remarkable was the effect the appearance of Jesus had on His disciples. They were transformed from a group of sniveling cowards into men who traveled the world, preaching that Jesus was God and had risen from the dead. Because of their message, almost all died horrible deaths of torture. Merely changing their story would have spared them this persecution. They had absolutely nothing to gain and everything to lose if their story wasn't true. Would a half dead Jesus, who had dragged Himself from the tomb to their doorstep, have inspired this response? The second attack on reality has been around since before the moment of resurrection - the idea that the disciples stole the body. The religious leaders who had Jesus murdered feared this possibility and took the logical precautions to prevent this from happening. Guards were placed at the sealed tomb to guard it day and night. How could a group of "rag tag" Jewish fishermen have over-powered a group of highly trained and motivated guards? How could they have moved a huge stone and sneaked away with the body unseen and unheard. The very fact that guards were posted adds credibility to the fact of the resurrection. If any of the details reported in the Bible were false, they would have been successfully refuted by the Jewish leaders. Although they tried, they were unsuccessful in their attempt to discredit the facts of the resurrection. Evidence for the truth of the resurrection was apparent to the thousands who were converted to Christianity soon after the event. The rapid spread of this persecuted faith is perhaps the greatest evidence of its reality. The facts of the resurrection were checked by converts of that day and led to changed lives. They still do today. Christianity has nothing to fear from those honestly searching for the truth. It is based on logical evidence surrounding real events in time and space.